This year, I had the pleasure of teaching an incredible young woman who transferred last fall. During one of our earlier conversations, she told me about a program she was involved in at her previous school called WE. After hearing her share stories of service and empowerment as a result of WE and WE Day, more specifically, I knew I had to learn more. WE is more than an organization, it’s a movement that encourages and empowers youth to make a difference on both a local and global scale. By committing one small action of positive change, young people show themselves and others that no matter your age, you can make this world a better place. I don’t know if there’s anything better than that that reflects the Kermit Says… philosophy of encouraging, empowering, and enriching teens. Students from all over the world are a part of the WE Movement, and lead year-long service projects within their community and abroad. The reward for their projects is WE Day, a day that celebrates their efforts with musical performances by artists like Selena Gomez and Big Sean and motivational speakers by game-changers like astronaut Buzz Aldrin, activist Malala Yousafzai, and young people like you. 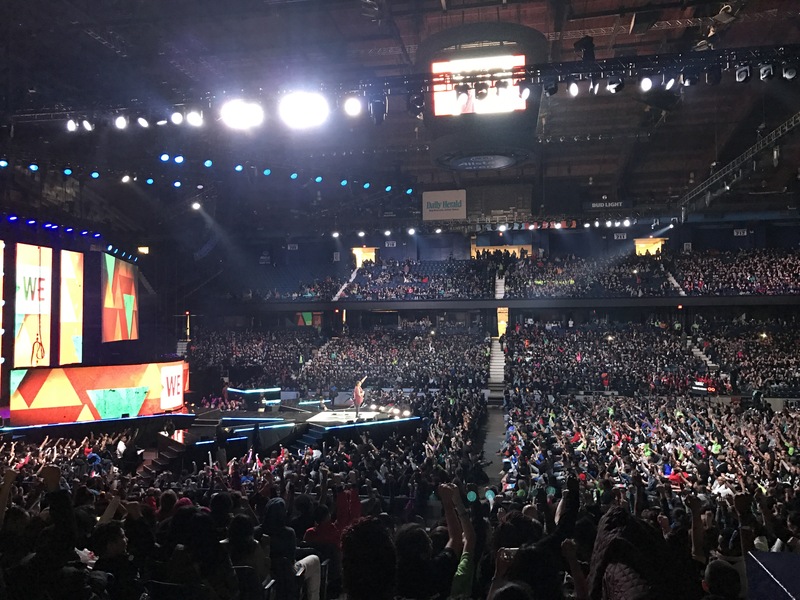 This year’s WE Day Illinois was no different, and I attended it as a Champion Youth Greeter who welcomed young people from all over, and even had a chance to step on stage and talk about the importance of volunteering! There I was (nervous as heck) speaking to more than 15,000 young people who caught the service bug early, not knowing that I’d only just been bitten, that this work and dedication to service had only just begun. I thought attending WE Day would be an experience I’d never forget, but I don’t think I realized just how much it would affect me–and it’s only been a few hours. I can’t stop thinking about the stories I’ve heard today. Stories of courage and determination, of standing up against injustice and rising above adversity. These are stories that moved me and now inspire me to live WE more intentionally–to act with humanity and purpose, to do good and be good, and to be an agent of positive change. If each of us would step outside of ourselves and lift each other up, think of how much stronger and better connected we’d be. This is living WE to me, and I’m taking the pledge to do just that wherever I go. Will you join me? Take the pledge and learn more about WE at we.org.